Brief Description of Subject: One in a set of three windows located on the east side of chancel. 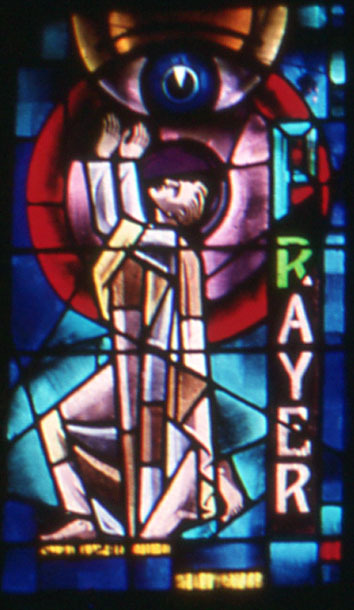 Prayer depicts a man in prayer. The circles in the background are the expression of the communication of man with the Deity, the all seeing eye, through prayer. . Most windows in the Alumni Memorial Chapel are sets of three on the same general topic with the same donor. This window is grouped with Self-denial (L1b) and Charity (L1c). Designed by Anthony Mako.